The Abundance of marine life and the beauty of the coral reefs surrounding Koh Tao have lead the island to become one of the major dive spots in Thailand. 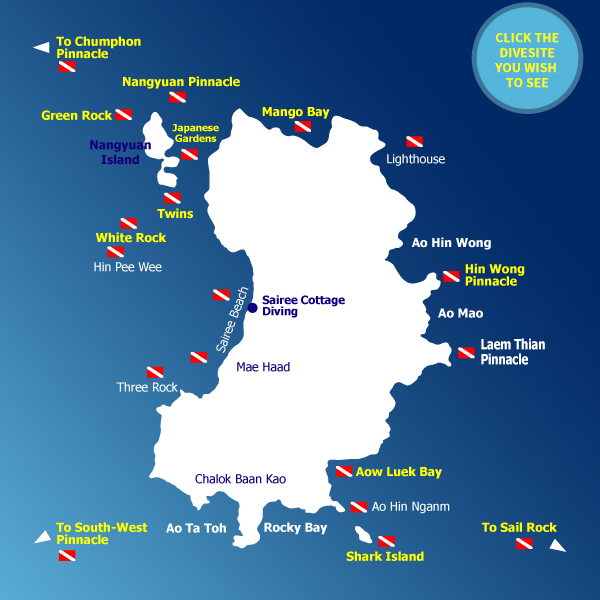 There are over 20 dive sites surrounding the Island. The water is an average temperature of 28 degrees Celsius with few or no currents at most dive sites. The dive site depth ranges from 10 to 40 meters making scuba diving enjoyable for all levels of divers. While most dives have an average depth of 12-18 meters, some dive sites like Chumphon Pinnacle or Sail Rock are perfect for deeper exploration. A fantastic addition to the the island is the wreck of the HTMS Sattakut. Sunk in 2011 by the Royal Navy, it’s a 50m long warship that served in the U.S. navy during World War II. A great variety of marine life can be seen while diving around Koh Tao’s dive sites! There are Boxfish, Banner Fish, a variety of Moray Eels, Scorpion Fish, Angel Fish, Clown Fish, Trigger Fish, Butterfly Fish, Sweet Lips, many different Groupers, Barracudas, and Turtles. If you are lucky you can see Octopus, Reef Sharks, Whale Sharks and there’s loads of little critters such as craps and shrimps tucked between Anemones. Scuba diving in Koh Tao is possible all year around with peak seasons tending to be around December to April and again from June to September.